Nikita, a 308-pound Amur tiger, was blissfully gassed out on a gurney at the National Zoo. On Saturday morning, as the orange, black and white feline lay on her side, her tongue dangling out, some 15 zoo staffers fearlessly hovered. They opened her mouth, checked her heart rate, and, crucially, monitored for the slightest signs of muscle twitches and the long-shot chance that she’d suddenly wake. Everyone knew the stakes. It would be bad, very bad, if Nikita woke up in this moment, in this very small room. The 6-year-old was getting a root canal. Then, Barron Hall, a Northern Virginia-based, board-certified animal dentist, did what no other sane human would do to a sleeping tiger. He jammed a needle into her upper left canine tooth. Near the top. Near the gums. He kept doing this. Over and over. 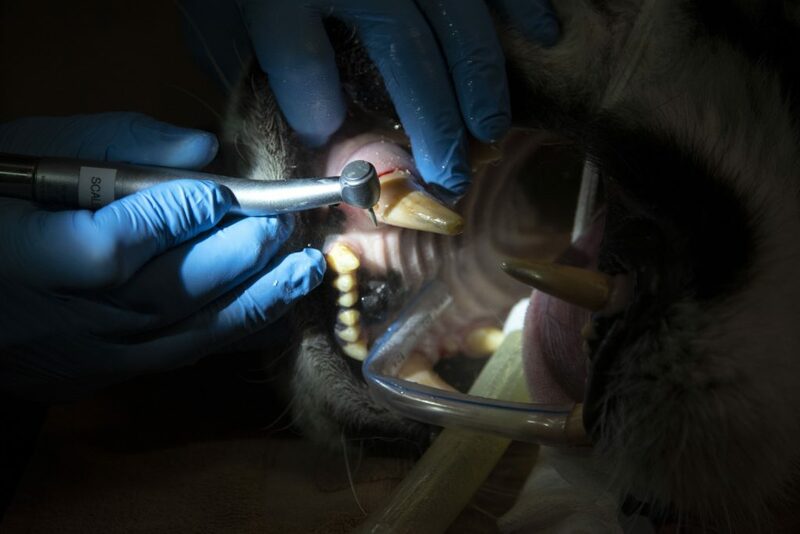 But this was his job – digging a hole, irrigating the tooth’s precious insides, and restoring it – and he’s one of animal dentistry’s best. (He has worked on Secret Service dogs and more than 50 tigers.) And Nikita deserved the best. She’s part of the Amur tiger subspecies, an endangered population that lives mostly near the Amur River in Siberia. Poaching and habitat loss have reduced their numbers dangerously. As few as 360 are left, according to the National Zoo, but conservation efforts in Russia promoted by President Vladmir Putin have helped slow down the decline. Fear not, Nikita does not hail from an Internet troll farm. And she’s no spy. Nikita was born at the Bronx Zoo in New York in 2012 and came to Washington in November 2018 so she could commune with the National Zoo’s other Amur tiger, an 11-year-old named Pavel. He arrived at the National Zoo in the fall of 2017 from Lincoln Park Zoo in Chicago. For the National Zoo, Pavel was a huge prize: He was the first of his endangered subspecies to be exhibited here since 1948. As Hall, the dentist, began the procedure Saturday morning, he explained the root problem. Since Nikita fractured the crown of her tooth at some point in the past several months, bacteria had wormed their way into the tooth’s exposed cavity – the “pulp” – which contains blood vessels and nerves. Then Hall got out his needles. Technically, they’re known as “files.” They’re made of stainless steel and look exactly like the kind of instruments no human would want to see poised above their mouth without being under anesthesia. “I’m just accessing the pulp cavity,” Hall said nonchalantly, shortly after he started jamming one file after the other into the enamel of Nikita’s tooth. He needed to drill a hole so he could extract the bacteria and dead tissue from the pulp. Was he scared about the whole jabbing-a-tiger-in-the-tooth thing? Hall, who has served as the National Zoo’s animal dentist for the past 12 years, seemed to delight in his job. Toward the end of the procedure, he dug his file into the tooth and pulled it out to show off what he’d excavated. Finally, the drilling, the jamming, the digging, it was all over, mercifully. He’d cleaned her tooth out and filled it in. Cosmetically, Nikita looked brand new. The zoo’s staff hoisted her off the gurney and placed her into an adjacent fenced-in enclosure, Cage No. 7.